Important: this course is only available for registration to those therapists who have successfully completed Connecting the Dots on Reflex Integration, Part 1. To find out when Part 1 will be offered again, please sign up here for email updates. To host Amy and Evelyn to present Part 1 in your area, please email info@handsonapproaches.com for hosting opportunities. You've taken Connecting the Dots on Reflex Integration, Part 1 and now have a handle on how to evaluate a child and determine what needs to be done to help. Now the goal of treatment is at hand. You'll come out of this course with treatment ideas and protocols to help the children in your classrooms and homes with unintegrated reflexes, using evidence-based protocols and multiple reflex integration programs. You will know which method is the most relevant to treat presenting issues and how to use it effectively. Connecting the Dots on Reflex Integration, Part 2 is a course jam-packed with information and practical takeaways. This interactive course gives you a practical real-life toolbox through a hands-on all-day lab, before and after videos demonstrating actual client progress, detailed handouts and more. Clarity. Direct applications. The tools that make a difference. If you ever felt puzzled about the best way to treat a young client with reflex integration issues, this is the course for you. 10 contact hours. Certificates will be awarded. Approved by AOTA for 1.0 CEUs. Recognized by NYSED State Board for PT as an approved provider of PT and PTA continuing education. Approved for 10 contact hours. • Review analysis of primitive and postural reflexes and how to analyze test results. • Analysis of the Moro reflex, its function, movement patterns, and its effect on physical, language, and social-emotional development. • Exploration of the correlation between a retained Moro reflex and anxiety. 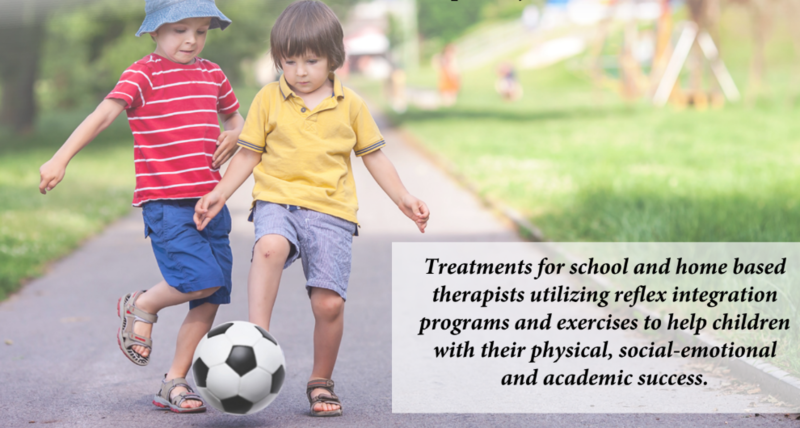 • Treatment strategies using various reflex integration programs and protocols to address anxiety, auditory processing delays, dyslexia, ADD/ADHD, OCD and generalized developmental delay. • Review of therapeutic methods and protocols and determine which ones to implement based on a child’s reflex profile and presenting symptoms in order to effectively treat reflex integration issues. Case studies of therapeutic interventions of actual clients. • Describe the effect of a retained Moro reflex. • Explain the relationship between the Moro reflex and anxiety. • Explain the components of designing a reflex integration program. • Identify and explore the reflex integration exercises addressing the Moro, TLR, ATNR, STNR, and Spinal Galant, as well as postural reflexes. • Demonstrate techniques to implement reflex integration protocols based on diagnosis. • Demonstrate techniques to implement and adapt reflex integration programs for the school environment. • Demonstrate techniques to upgrade and downgrade reflex integration programs.